A timeline of Settlement with a 5-yearly progression of land surveys. The development and decline of the railways. Excellent Article by W. Stephen Smith, B.V.Sc.,F.A.C.V.Sc. PDF file. Timeline and early Newspaper articles showing the development of the electricity grid in South Australia. A brief description of the creation of Road Boards, etc, with an 1879 newspaper article on the condition of the Main North Road. Whims, wells and the Morgan - Whyalla Pipeline. Correspondence between an 'old' settler and a Glaswegian. The last paragraph is a gem. Rainfall chart, maps and articles describing the creation of Goyder's Line of rainfall. Newspaper article describing the Hundred, the towns of Carrieton and Eurelia, and the problem of water. Newspaper article describing the settlement of the early agriculturalists. Newspaper article describing the establishment of the town of Peterborough, the railways and the water. 1865 "..concessions to Lessees in consequence of drought. The Mount Remarkable Mining Company, which was formed in November 1846 with a capital of £25,000, explored for copper in the region where Melrose was later built. They were unsuccessful, the workings consisting only of a 50 - 60 foot tunnel and a 20 foot shaft. 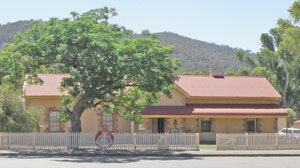 It is, however, because of this early mining venture that the hundred of Wongyarra was the first to be surveyed in the Southern Flinders Ranges in 1851. The town of Melrose was at the northern end of the hundred and the town of Bangor at the south. Bangor, at the eastern end of the Port Germein Gorge Road, where its ruins can still be seen, did not survive. Melrose became one of the more attractive of the many attractive Mid North towns. Backed by the majestic Mount Remarkable with its abundance of walking and cycling trails (the Heysen and Mawson Trails pass nearby) Melrose is close to the health services at Booleroo Centre and the regional centre of Port Pirie. It also has a school and shops. As well as being a centre for walking and cycling, there are abundant historic sites to explore both inland and towards Spencer Gulf. It is a beautiful, thriving little town.